﻿ Tamiya, 56039, 1/16 RC Jagdpanzer IV/70(V)Lang Full Option. 56039, 1/16 RC Jagdpanzer IV/70(V)Lang Full Op. 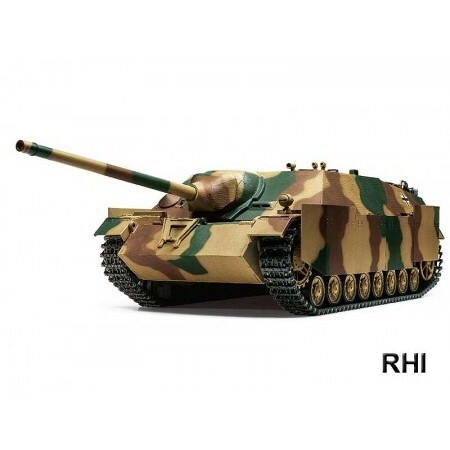 Tamiya, 56039, 1/16 RC Jagdpanzer IV/70(V)Lang Full Option. 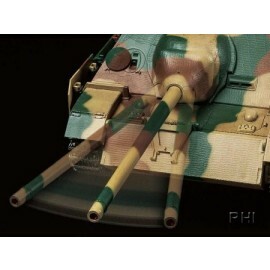 The latest model in the thrilling big scale 1/16 R/C Tank Series depicts the Jagdpanzer IV /70(V) Lang tank destroyer. This German AFV which proved formidable following its introduction late in WWII, was a popular release in our 1/35 Military Miniature series of static models in 2014 (Item 35340). 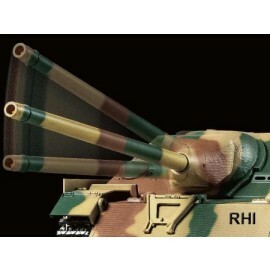 The "Lang" (German for "long") in its name was added to distinguish it from its predecessor with a shorter L/48 7.5cm gun; the design featuring a wedge-shaped glacis plate and utilizing the Pz.Kpfw. IV chassis was largely shared by the L/48 and L/70 varieties. 930 Jadgpanzer IV /70(V) Langs were produced between August 1944 and March 1945, and fought bravely in last-gasp actions such as along the Ardennes front from December 1944. 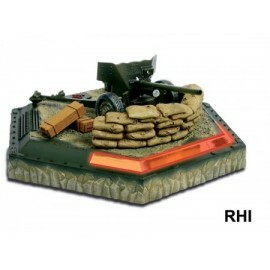 - This is a 1/16 scale R/C model assembly kit. - The chassis is powered by a pre- assembled gearbox with two Type 380 motors and features metal parts such as the chassis, suspension arms, drive sprockets and more, for excellent durability. - Features a realistically weighty aluminum gun barrel. - Included DMD Control Unit T-03 has two FET speed controllers for operating two running motors and allows control of various tank functions. - DMD Multi Function Unit MF-05 connects to DMD control unit T-03 to provide many realistic effects such as main/machine gun firing sounds, muzzle flash and recoil movement. - Compatible with the Battle System (Item 53447) for fun and interactive battles with friends! - Requires a 4-channel transmitter with self- neutral function, battery pack and transmitter batteries.